Only at Owens, a twenty-two foot honey which is really one for the money! Smooth lines and sturdy built, this is the roomiest yacht. The combination of distinctive two-tone colors makes a beautiful boat, and the large deck and spacious cabin makes a comfortable experience. Equipped with twin outboard engines, this luxury cruiser has been designed to combine performance and functional benefits with the beauty and comfort. 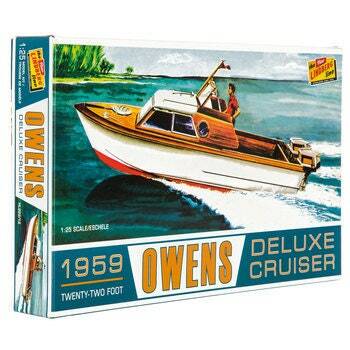 Piece 1959 Owens Deluxe Cruiser Model Kit together, customize it with paint, and show it off!